Saturday, August 25, 2012. I like thinking about restaurants in terms of themes. Every business needs a concept, after all. For the Market Restaurant in Gloucester, Massachusetts, the theme that comes to mind is balance. For instance, the balance between high-quality, priced-accordingly food and the casual atmosphere, a walk-off-the-boat-and-into-the-restaurant vibe where you hear your shoes clank on the wood of the dock as you approach. 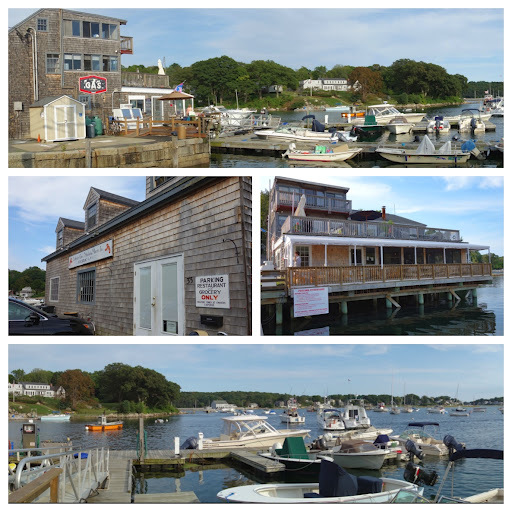 The Market is located on Lobster Cove’s waterfront beside an ice-cream window and an outdoor picnic table and a cutting board for cleaning fish, yet it serves top-quality food in finely tuned preparations. The menu reads like Michelin, quite a counterbalance to the sign proclaiming that shirt and shoes are required. My boyfriend’s mother had wanted to try this restaurant for quite some time. We knew that the restaurant’s chefs, Nico and Amelia, had met while working at Alice Water’s Chez Panisse in Berkeley, California, a restaurant that has been at the fore of the slow-food movement. What’s more, my boyfriend’s mother had an indirect family-friend connection to Amelia, and isn’t everyone more intrigued to try a restaurant after someone points out a degree-of-separation line between you and the chef. Unfortunately the Market is approximately an hour-and-a-half drive, which had made visiting difficult to plan, and on top of that the Market is only open seasonally and closes in October. Nevertheless, toward the end of the summer we found an opening and made a reservation for 5:30pm on a Saturday via Urbanspoon. We spent the week beforehand looking forward to the meal. Exterior of the Market Restaurant in Gloucester. We arrived about a half hour early and managed to snag a parking space right in front. We walked around the area taking photo after photo after photo, because my boyfriend has become obsessive about photography, while we waited for the restaurant to open at 5:30pm. It was good that we arrived so early, though. The light was beautiful, it gave us a chance to stroll around Lobster Cover, and as we watched the area later we realized how lucky we were to have gotten a parking space right in front of the building. The Market has three types of seating available: outdoor porch, indoor, and bar seating. We opted for indoor seating along a window-lined wall looking out over the water. The windows were screened and open and the fresh salt air streamed in, and our view of the waterfront was gorgeous! Inside the restaurant and behind the bar was what looked like a large blackboard. It had drawings on it, including a map of the Market’s food sources on the North Shore (also available on their website). I was especially excited to see A&J King Bakery on the list, the makers of my favorite sandwich. I recognized several other names. As it happens, A&J King also lists their sources openly, and this is a trend I like. The transparency reassures me of the quality. In a world where restaurants are pressured to list detailed nutritional information on their menus, I think it’s arguably more important to know where your food comes from. 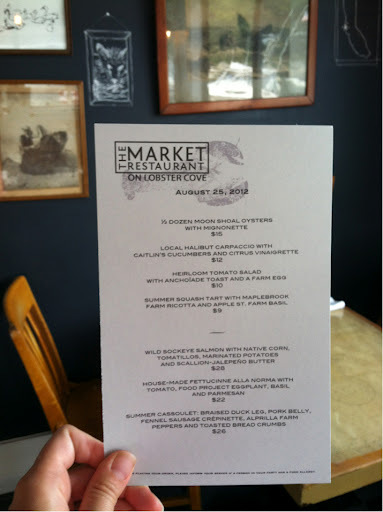 The Market’s menu changes daily, much like Chez Panisse. Based on my dinner experience and then scrolling through previous menus on the website, the usual menu selection offers four appetizers and three entrees. The Market in Gloucester’s menu for Saturday, August 25, 2012. Photo via the Market’s website. My boyfriend and I divided up the bread in our typical fashion, which is for each of us to grab a third and then argue over who gets the remaining third. (Spoiler alert: I usually win.) In a departure from my normal ice water, I ordered a Spindrift Arnold Palmer. 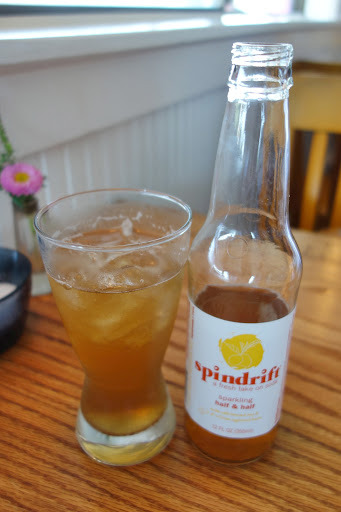 Spindrift is a company that began here in Charlestown, Massachusetts when its founder decided that the natural-foods movement should have its own soda. Good decision. A&J King also serves Spindrift, as do some of my other favorite restaurants around Boston. Spindrift sparkling half & half. Both my boyfriend and his mother ordered the halibut carpaccio for appetizers and the wild sockeye salmon for entrees. Everything on the menu sounded delicious and I had trouble deciding what to order. After some hemming and hawing, I opted for the heirloom tomato salad as an appetizer and the fettucine alla norma for an entree. 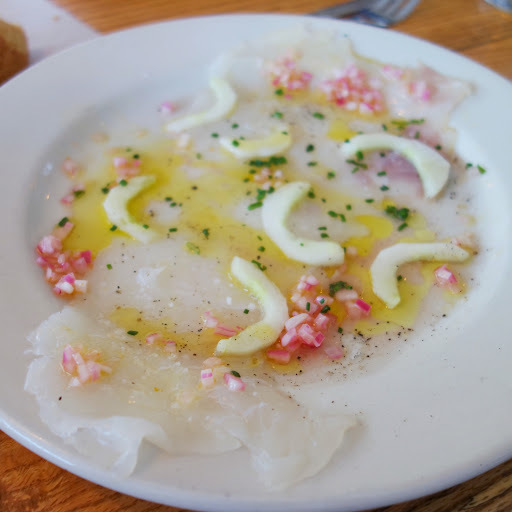 The halibut carpaccio ($12) came with cucumbers and a citrus vinaigrette. The halibut was fresh and very thinly sliced, the cucumbers were crisp, and the olive oil drizzled on the dish was top-notch. There was more food than there looked at first glance. The flavors of citrus and olive oil were strong but did not overpower the halibut — another example of the Market’s grasp of balance. Halibut carpaccio with cucumbers and a citrus vinaigrette. My heirloom tomato salad ($10) came with anchoiade toast and a farm egg. Let me begin by saying that these tomatoes were incredible. I have many childhood memories of my brother biting into giant beefsteak tomatoes as though they were apples. At the time, I never understood what could possess someone to do that. Then I tasted the fresh, juicy heirloom tomatoes at the Market, and understanding washed over me with all its seeds and delicious juices. Heirloom tomato salad with anchoiade toast and a farm egg. The bigger tomatoes on the plate were slightly sweeter than the smaller tomatoes. I loved the colors! When I consider how much color contributes to a dish and how many rich and vibrant colored tomatoes are available, I am always a little sad when I see a tomato-themed dish that doesn’t capitalize. This did. 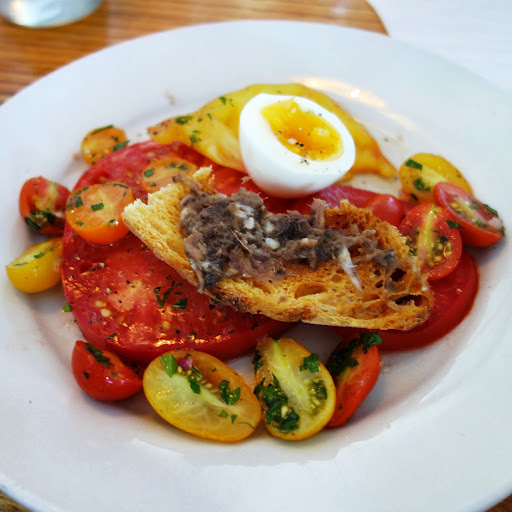 The hard-boiled egg’s flavor complimented the tomatoes’ sweetness, and the anchoiade toast added a salty, ocean-y bite. 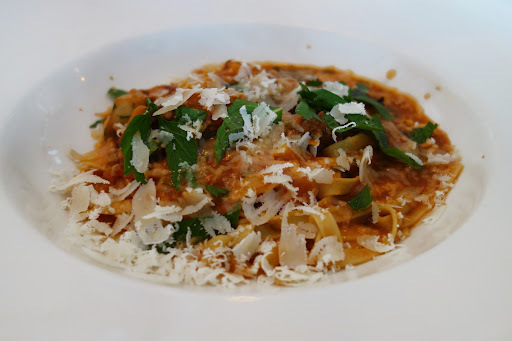 My housemade fettucine alla norma ($22) had tomato, Food Project eggplant, basil, and parmesan. It was delicious! Eggplant isn’t an ingredient that I opt for often in my dinner selections, but it’s part of the traditional Sicilian pasta alla norma so I gave it a shot — and ended up liking it so much that I ate every bite. The pasta sauce was delicious: flavorful tomatoes, slightly spicy, good consistency. Housemade fettucine alla norma: tomato, Food Project eggplant, basil, and parmesan. 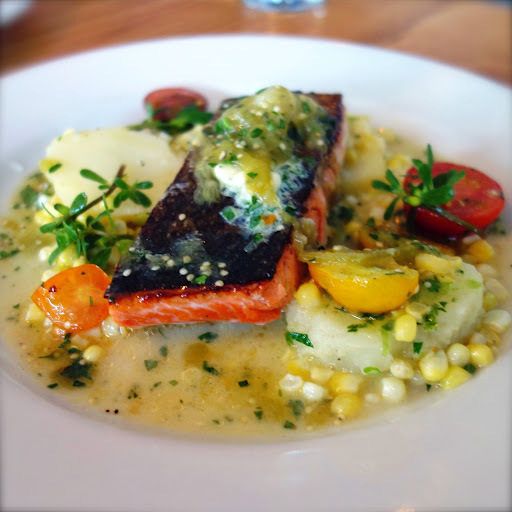 The wild sockeye salmon ($28) came with native corn, tomatillos, marinated potatoes, and scallion-jalapeno butter. I didn’t try it, but my boyfriend and his mother both enjoyed their entrees. They reported that the corn was very sweet and the salmon cooked nicely. Wild sockeye salmon with native corn, tomatillos, marinated potatoes, and scallion-jalapeno butter. For dessert my boyfriend and I both ordered the tres leches cake ($10) and a glass each of the Russell Orchard apple cider ($4). I liked my cake quite a lot. In keeping with the “balance” theme, the texture of the fluffy whipped cream balanced out the moist, heavier cake. 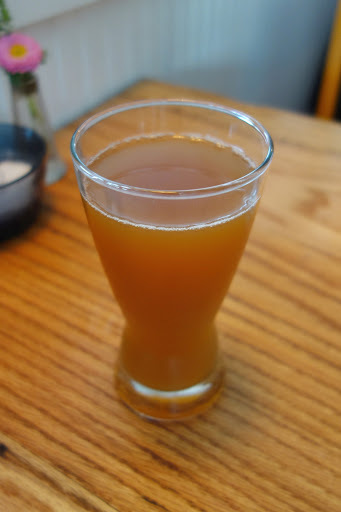 And the cake’s flavor and drizzled caramel went nicely with the cider! 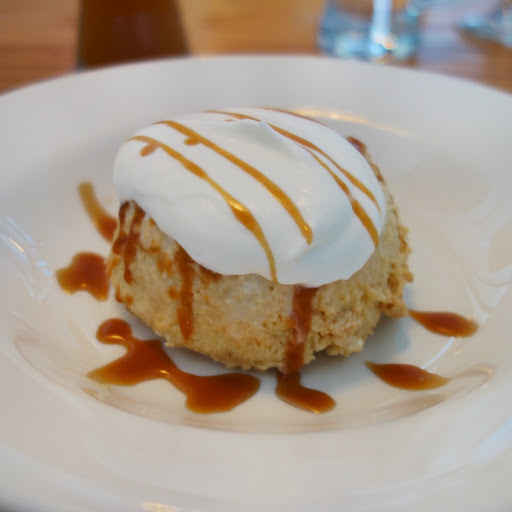 Tres leches cake with whipped cream and caramel drizzle. 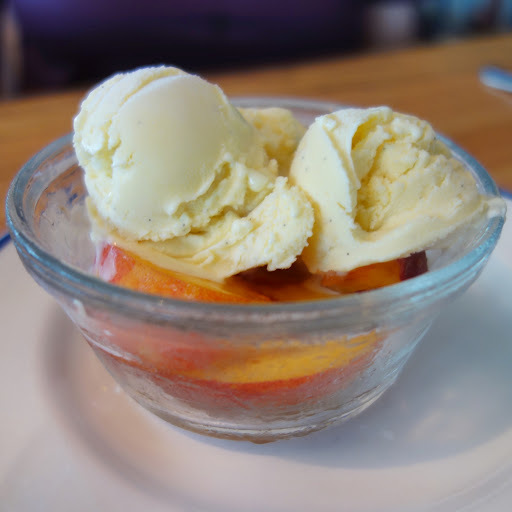 My boyfriend’s mother ordered the house-made crème-fraiche ice cream with Brooksby Farm nectarines ($10). I had never had cream-flavored ice cream before, so I was eager to try it. I liked it and thought that it was a good pairing for the fruits. Creme fraiche ice cream with nectarines. All in all, I had a fantastic experience at the Market Restaurant. I would return more often if it weren’t such a long drive. There is something ironic about me driving three hours round-trip to patronize a slow-food restaurant, particularly when there are other excellent restaurants closer to me that also focus on local ingredients. But I wouldn’t describe those restaurants as “similar” to the Market. This is definitely a step up in terms of concept, and I think the chefs succeeded well in execution. One correction. According to my memory, what actually happened was that I *allowed* you to take the remainder of the bread, which you then ignored while I and millions of starving children worldwide went hungry.